On October 27 the HyoJeong Academy of Arts & Sciences held its inaugural meeting in Europe. 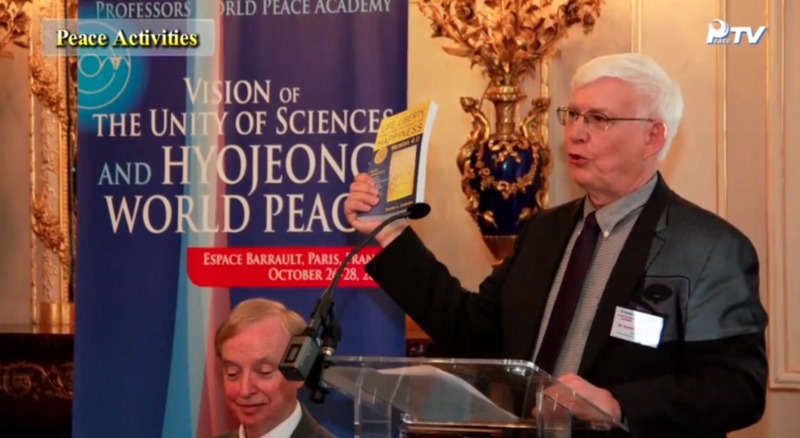 This Korean-based Academy, founded by Hak Ja Han Moon, sponsored the 28th International Symposium on Unification Thought under the title “Vision for the Unity of the Sciences and a HyoJeong World of Peace.” Dr. Thomas Selover, President of PWPA-International in Korea, chaired a PWPA Forum at the historical Maison des Polytechniciens in Paris. PWPA-USA Secretary-General Gordon Anderson presented his thoughts on the future of PWPA to participants in HyoJeong Academy meeting at the Polytechnic Institue in Paris, France. Dr. Thomas Selover (behind) chaired the panel discussion. Greetings from Gordon L. Anderson, Editor-in-Chief, International Journal on World Peace, and Member of the Board of the James R. Mancham International Centre for Peace Studies and Diplomacy. This 8 minute video greeting recounts Sir James’ distinction between “politician” and “statesman.” It also emphasizes the distinction between negative peace and positive peace, indicating negative peace relates to security and positive peace to human happiness. Negative peace involves legal guarantees of rights that come from government, while positive peace requires motivation, skills, and responsibilities that come from the cultural and economic spheres. Note: The author of this article, who resides in Europe, believes it is important to promote discussion in the US about smaller steps of conflict reduction such as divided family contacts, increased economic cooperation, and other forms of citizen and private sector exchanges. The holding of the Winter Olympics in South Korea from 9 to 25 February followed by the Paralympics 9 to 18 March may be an an opportunity to undertake negotiations in good faith to reduce tensions on the Korean Peninsula and to establish, or re-establish, forms of cooperation between the two Korean governments. Such negotiations in good faith would be in the spirit of what is known as the “Olympics Truce”. Truce in classic Greek meant a “laying down of arms”. 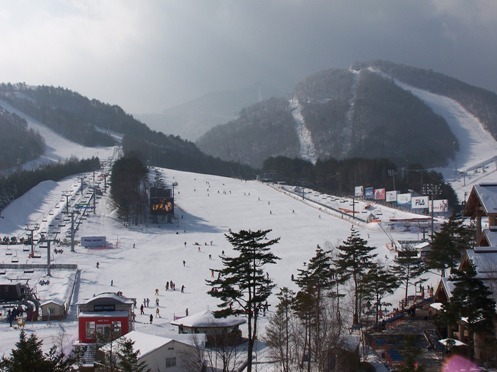 A truce was usually announced before and during the Olympic Games to ensure that the host city was not attacked and athletes and spectators could travel safely to the Games and return to their homes. 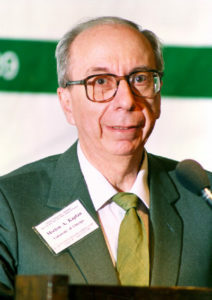 Morton A. Kaplan, Past President of PWPA International and Distinguished Service Professor Emeritus at the University of Chicago, passed away September 27, 2017. He was 96. Morton A. Kaplan presiding at the Liberal Democratic Societies conference in London, 1989. Victoria, Seychelles – International Centre for Peace Studies and Diplomacy named after the late Seychelles Founding President Sir James Mancham has been officially inaugurated on Eden Island, near the capital Victoria. The Centre was originally Sir James’ idea and for the past couple of months has been developed by the University of Seychelles, the Mancham Family and an international group of diplomats and businessmen. 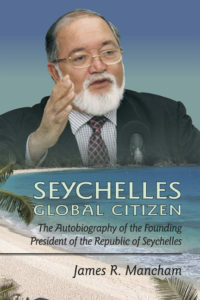 JAMES RICHARD MANCHAM (1939-2017), Founding President of Seychelles and member of the editorial advisory board of International Journal on World Peace, passed away on January 8, 2017. He will be missed by the people of Seychelles, our staff, and many others. Systems approach vs. a strategic approach. In moral terms, this often breaks down into concern for the whole vs. self-interest (strategizing to accomplishing one’s end). Today almost all public policy is based on individual and group self-interests competing over, and strategizing to acquire, public money. Partisanism prevents using public money for the purpose of the whole. Our big PWPA Congresses examined social systems: the USSR system, the Chinese System, and Western Democratic societies. It is important that both the needs of the whole and individuals are addressed. Systems analysis should ensure that both are met. Principles of sound governance. The Divine Principle, authored by PWPA’s Founder, Rev. Moon, is based on spiritual principles. He made some observations that provide clues to how principles of governance need to be considered. For example, the relationships of the political, cultural, and economic spheres function as organs of the body (the human biological system), with each social sphere performing a role as an organ of the larger social system. I discussed five main principles necessary for good governance in my book Life, Liberty, and the Pursuit of Happiness, Version 4.0 (2009). These are principles I believe were implicit in the understanding of the U.S. founders, when they drafted the U.S. Constitution, that are nearly always violated by new legislation passed by both the U.S. government and individual states today. Evolution of social consciousness. This involves the question of how societies rise and decline so that they can be guided within principled bounds to rise and avoid collapse. We are publishing an article on this topic titled “Seven Phases of Social Development: Politometrics Instead of Political Alchemy” by PWPA Professor Akmal A. Gafurov in the March 2017 issue of International Journal on World Peace. One could argue that the Ten Commandments emerged as a level of social consciousness of the principles of behavior towards one another required for more freedom to emerge. However, today we have social institutions and spheres based on urbanization and large populations. There have been no set of principles instilled in social consciousness related to social institutions and bureaucracy, which is one reason I wrote my book, hoping to promote some discussion of this. Issue-oriented policy. I think most the issues people talk about, environment, education, constitutions, overpopulation, nuclear power and weapons, space travel, economic equality, war, and peace, etc., fall under the umbrella of the above points. They are all things that fit in a context and can’t be fully studied as things in themselves. Conferences by PWPA on such topics, need to be discussed as parts of a complex system, the way weather predictions cannot be accurate without seeing the interconnection of a wide array of variables. For example, linear political arguments that tie ocean rise to carbon combustion by humans, without an interconnection to earth’s albedo in the arctic ocean, sunspot activity, the absorption of heat by solar panels, and thousands of other factors will inevitably lead to faulty policy decisions. Linear arguments in complex systems are a modern form of religious dogma and not real science. On March 25, 2015 the chapter of PWPA was boosted in Nepal at the Hotel Yak and Yeti, with more than 500 guests in attendance. The chapter was launched with the support and efforts of the Universal Peace Federation. 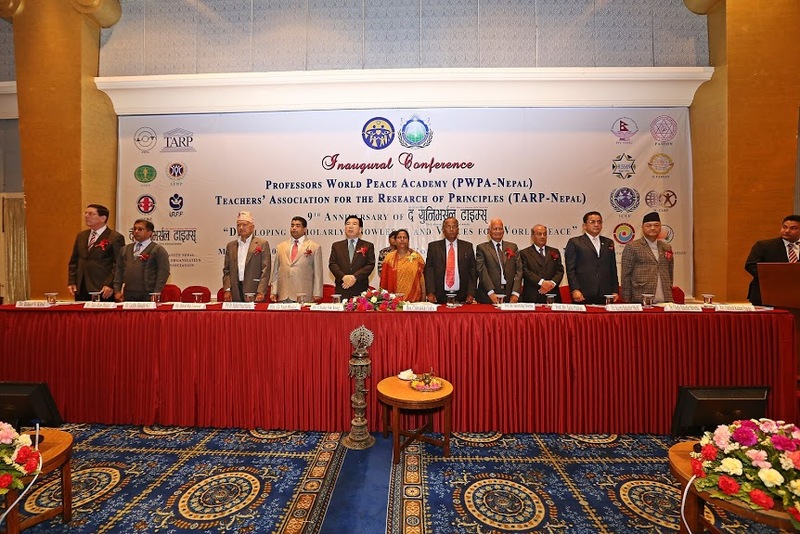 The assembly was addressed by Nepal’s minister of education, Hon. Chitralekha Yadav, Professor Dr. Suresh Raj Sharma, founding vice chancellor of Kathmandu University and patron of PWPA-Nepal, Professor Dr. Madhav Prasad Sharma, former vice chancellor of Tribhuvan University and president of PWPA-Nepal, and Professor Dr. Tulsi Prasad Pathak, outgoing PWPA president. Distinguished representatives of the Universal Peace Federation, and the newly formed Teachers Association for Research of principles (TARP) also spoke on this occasion. PWPA is highly appreciative of the work or Dr. Robert Kittel, longtime UPF and PWPA representative in South Asia, for his efforts in organizing and reporting on this activity. 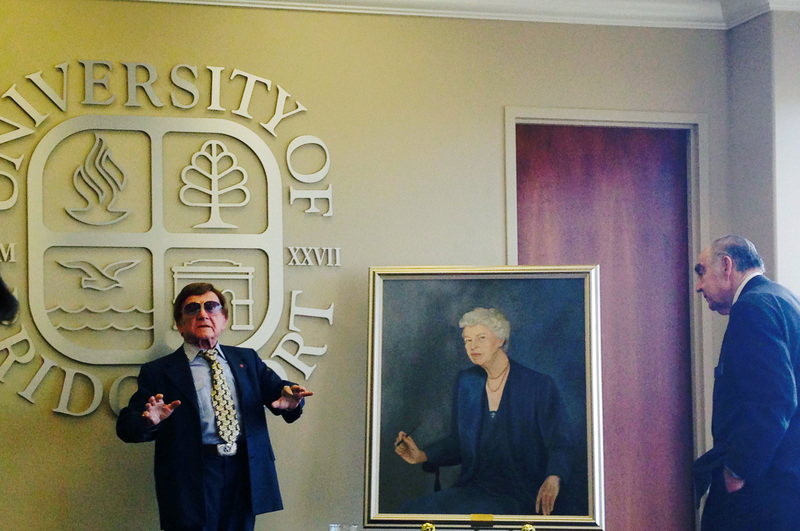 On December 12, 2014,Professor Nicholas N. Kittrie, Chairman of the Eleanor Roosevelt Institute for Justice and Peace in Washington, D.C., and President of PWPA-USA presented a portrait of Eleanor Roosevelt that he had commissioned to the University of Bridgeport. Eleanor Roosevelt, wife of U.S. President Franklin D. Roosevelt, is known for her work spearheading the drafting of the United Nations Declaration on International Human Rights. She spoke at the University of Bridgeport in 1953, and the University has supported the United Nations since its founding. Prof. Kittrie has worked on a number of United Nations commissions related to international justice and peace. The portrait was received on behalf of the University by Frank Zullo, Chaiman of the UB Board of Trustees. Education in a global society is a real challenge because education is culture specific. It involves teaching the knowledge, values, and skills known to a particular society. Many of beliefs and values of a society are not taught formally, but absorbed through the language and habits of those who surround one’s upbringing. We can call this the conventional knowledge of the particular society. In the twentieth century, the conventional knowledge acquired by people in their various societies collided in a world of global transportation and communication, stimulating globalization. This globalization was developed on the foundation of Western Civilization, which oversaw the rise of modern science and the modern secular state. The negative impact of these developments included, Western colonialism, World Wars, and the decline of the traditional values. The human suffering caused by the world wars led to the creation of the United Nations, whose values are enshrined in the UN International Declaration of Human Rights, drafted under the supervision of Eleanor Roosevelt.